On Thursday morning some security guards spotted a leopard wandering into a Maruti Suzuki factory about 20 miles south of New Delhi. What happened next was a shutdown and a hunt for the wayward cat that involved tranquilizer darts, firecrackers, and goats. 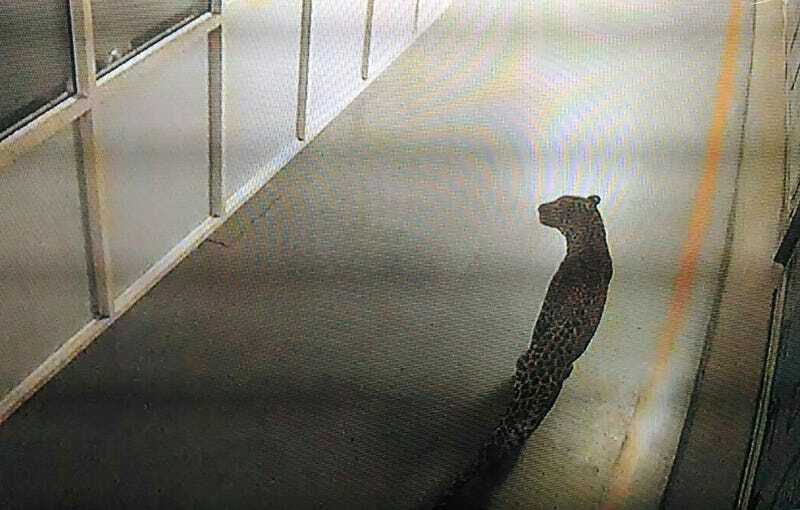 It began in the early hours of Thursday, when cameras at the factory, which makes gas and diesel engines, spotted the leopard casually walking around. When 1,000 workers showed up a few hours later for the 7 a.m. shift, they were locked out. Little did the rangers inside the facility know that the hunt for the leopard was just beginning. The drawn out operation appeared farcical at times, with wildlife officials using firecrackers to try and scare the animal out of its hiding place. They then placed live goats in cages around the factory complex to try and entice it, drawing complaints from animal rights activists on Twitter. The firecrackers and goats, alas, were to no avail. According to AFP, the leopard was only found after being spotted Friday on the factory’s cameras again, not far from where it was first spotted, apparently having spent some time to itself. It was promptly shot with a tranquilizer dart and wildlife conservators removed it from the plant. Some numbers from the hunt: Around 200 police and wildlife officials were involved, at least two factory shifts were canceled, and tens of thousands of dollars in productivity was lost at the plant, which makes nearly a million vehicles per year. I’m sure the leopard had a good time though. Who wouldn’t love to spend a day (mostly) alone in India’s largest car factory?